Research Library > Equinix > Equinix Performance Hub Gives Enterprise Networks a Giant Boost. 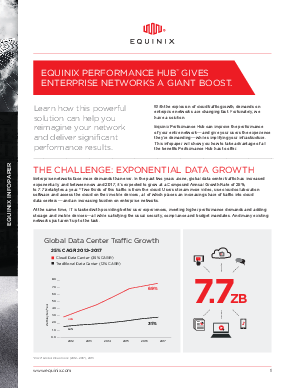 Equinix Performance Hub Gives Enterprise Networks a Giant Boost. Enterprise networks face more demands than ever. In the past two years alone, global data center traffic has increased exponentially, and between now and 2017, it’s expected to grow at a Compound Annual Growth Rate of 25%, to 7.7 zetabytes a year. This infographic provides information on how Performance Hub is designed to improve the performance of your entire network while simplifying your infrastructure and lowering your Total Cost of Ownership. Download this infographic to learn how this powerful solution can help you reimagine your network and deliver significant performance results.